Following the hardship and suffering been encountered while accessing medical needs in far distance away from their community, people of Ungwan Pama, Ungwan Baro and Sabon Tasha, all in Chikun Local Government Area of Kaduna State, Northwest Nigeria, have made a passionate appeal to the State Governor, Nasir El-Rufai, to come to their rescue by completing an abandoned health facility in the area. Daily Sun investigation revealed that the project, which is about 80% completed, was initiated by Chikun local government when Namadi Sambo was the governor of the state before he was nominated as vice president and moved to the Federal Capital Territory, Abuja. The locals said the chairman of the local government then abandoned the project because he did not stay quite longer after the political accident that catapulted the immediate past vice president Sambo to Aso Villa. But one wonders if there has not been government ever since to continue from where the previous government stopped. The building has been completed, roofed, windowed, painted with burglary proof even though the windows have been vandalized by miscreants. Strategically cited amidst the three communities, the health facility which is now playing host to pigs, goats and reptiles, would be a save haven for minor but fast killer ailment like malaria, typhoid fever and childbirth associated pangs of put into proper use. The Village Head, Bakaci Baro I, Sagbayi Bawa, passionately appealed to Governor El-Rufai to put the machinery in motion and hasten the completion process as the structure need little funding to make it effective. “As community leader, I know it won’t take the government long time if they want to put it in proper use for the citizenry many of whom are tax payers. “This medical facility has been abandoned for a long time. Our people have to go through several miles before they can access medical assistance. So we will appreciate it if they can come and fix it. On behalf of this Palace and people of this community, I am appealing to our Governor, Malam Nasir El-Rufai to direct the administrator of Chickun local government to come and finish the good job they have started,” he added. Also, Mai-Ungwan, Maiyan, the immediate host community of the facility, Kassa Bulus Manyan, expressed discomfort over the state of the facility, doubting if the place is really meant to be an health care centre. “Actually I will not call that place an hospital yet due to its present state. I meant it is not completed. About seven years ago, people in government then came and built that place and when it was almost completed, they left. It was later we were bearing it is an hospital. It has been like that since, playing host to pigs, goats and reptiles. “It has been like that until recently when an NGO came and clear the refuse that was hitherto littered the place. After clearing the place for about a week, leader if the NGO promised to come back and fence it round. He then said that can only possible if the government will give approval for that effect because they started it and should be the one completing it. So it may be hospital tomorrow but certainly not today. “As you can see, this place has huge population of people with diverse background, ethnicity and beliefs. It comprises of Ungwan Baro, Ungwan Pama and Sabo all under Matagi district. You can then imagine the number of people that will benefit from it if only the people in government can have political will to put this place into use. That place is not suppose to be like that. “We don’t know what the problem is. Nobody has ever come to explain why it was abandoned apart from insinuations that it was abandoned due to change in government. Whenever any of them came, they will just look at the place and left. If not for the sake of little effort we are putting in that place, it would have been unconsciously burnt by people who dump refuse there unabated. We are appealing, we are begging them to please come and out the finishing touches and employ health workers to manage it. If the government do not fix it then who will? He asked. The non-governmental organization that clear the cite and promised to assist in fencing it round,The Youth Challenge, says it is reviving a health facility project abandoned for over six years to take adequate medical attention to the grassroots. Chief executive Officer of the NGO, Mr Andy Bako, who was sighted at the project’s site, urged the State Government to ensure speedy completion in the interest of the masses. According to him, “the NGO took the step to save life and respond to emergency cases in the area as well as improve the residents’ well being. “We want the government to take charge of the project so that the people will not have to trek many kilometres before accessing care in a health facility. We also want to reduce cases of sudden death. “For this one we are working on today, it is very unfortunate that it has been like this for the past 10 years. This clinic being built for a community was abandoned after it was roofed and doors and windows fixed, remaining the installation of equipment and employment of staff. “Now the doors and windows have been vandalised leaving it as a husbandry for pigs and goats. We as an NGO have decided to clean the place, and then invite the local government to take ownership by providing facilities and staff. This will enable the residents not to go far away for treatment,’’ he added. He pleaded specifically with the state government to assist the residents with modern health facilities when eventually set to complete it. “We know that each government comes up with new programmes and projects for the betterment of the people, so, we appeal to the authorities to renovate the project fast. Bako further suggested that there is the need for government projects to be protected by law so that new administrations would not be able to abandon them as so far been the case in Nigeria. 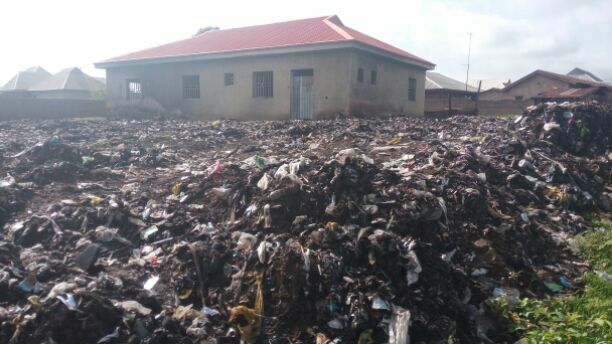 Elsewhere, a traditional title holder, Bala Jatau, confirmed the position of earlier speakers that the project started during the PDP regime and was abandoned, quickly added that the residents had turned the place to a dump site without any fear. Jataau was optimistic that the NGO’s commitment to the project would attract government support to rural areas in no distant time as there are other areas that equally need such facilities. “With this support by the NGO, the residents will have access to primary healthcare before visiting secondary facilities in the state,’’ he opined. Another resident of the area, Mrs Mary Musa, also appreciated the effort of the NGO and described it as a life saver. “The government abandoned the project without taking cognisance of the huge funds involved in initiating it. “When a new government comes to power, instead of continuing with the project, it leaves it uncompleted and initiates another only for resources to be wasted. “As the saying goes `Health is Wealth’, I urged the government to take over immediately so as to save the life of the people because we were made to understand that healthcare delivery is primary responsibility of government. She expressed satisfaction with the gesture by the NGO, adding that the government should intervene quickly and partner with more NGOs to reach the real people that needed government touch. “Abandoned projects should be completed and not left after spending a lot of resources for the sake of the masses. The health sector should not be toyed with,’’ she warned.